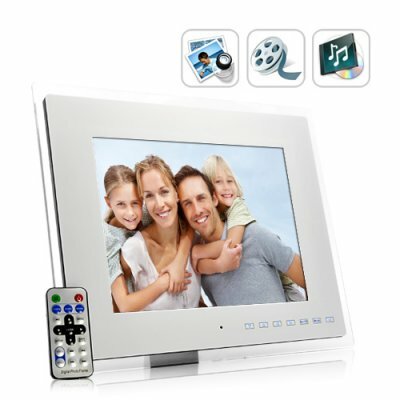 Successfully Added Masterpiece - 12 Inch Digital Photo Frame and Media Player with Remote Control to your Shopping Cart. Full of functionality, features, and fun - that's what you get with the Masterpiece 12 Inch Digital Photo Frame with remote control and multimedia player! The Masterpiece is a digital photo frame made for everyone. Whether you take photos or just like to collect them, this unit is for you. Why? Aside from supporting 8GB of external memory (for tens of thousands of photos! ), the huge 12 inch screen effortlessly handles individual photos up to 15MB. What that means is that it won't take forever to load your high resolution treasured memories. More importantly, all your DSLR camera pics will come alive on The Masterpiece. The Masterpiece is also a full-featured multimedia player capable of handling the today's hottest music and video formats like MP3, WMA, MPEG 1/2/4, XVID, DIVX, and AVI. With this type of power, maybe we should start calling it a digital home theater frame! This big screen digital photo frame looks as good as the pictures you'll put in it. But that's just the beginning. It's got lots of different slideshow modes to keep your streaming photo collection always fresh and original AND you can easily program the frame to play your favorite music while the slideshow is happening? Fun? WOW! The Masterpiece is a first class digital photo frame with its elegant exterior and innovative interior. It is also unbranded so it is the perfect resale item. Get one today to see how great this photo frame is, then order them in bulk to enjoy per item and shipping savings. Put it on eBay, and we'll even dropship it straight to your customer's door! Chinavasion - your best source for high quality, low priced gadgets. Includes full screen calendar, clock, and alarm function. Background music play during photo slideshow available. Accepts three types of flash memory connections: USB, mini USB, and SD card. Comes with predefined holes for easy wall mounting. Does this digital photo frame use batteries? How many pictures can this Digital Photo Frame hold? The number of photos this digital photo frame can hold depends both on the size of the memory card you insert in the Photo Frame as well as on the size of the image files themselves. This model can support memory cards up to 8GB capacity. If you consider that a good quality photo is roughly 200 KB in size, roughly 40,000 pictures could fit on a 8GB SD card. That's a lot of photos! How quickly does the digital photo frame cycle through images? You can adjust the rate to every 3, 5, 15 seconds or 1, 15 minutes, or hourly. You can also display just picture like a conventional photo frame, but where would the fun be in that? How do I load my pictures on to the Digital Photo Frame? Simply put your pictures onto a SD/MMC card or USB key and plug it in. That's it! The Digital Photo Frame will detect and cycle through your images automatically.